1Centro de Investigación de Medicina Tradicional y Farmacología (CIMTFAR) de la Facultad de Medicina Humana de la Universidad de San Martin de Porres. (FMH-USMP), PERU. El Corregidor Avenue 1531, La Molina, Lima12, PERU. 2Sociedad Científica de Estudiantes de Medicina de la Universidad San Martin de Porres (SOCIEM-USMP), PERU. Introduction: Jatropha curcas L. seeds are used in traditional medicine to treat a variety of diseases or conditions. The aim of this study is to evaluate effects on inflammation and the nervous system of ethanol extract of J. curcas seeds. Materials and methods: It was used 64 mice divided in 8 groups; respectively, 4 groups received 400, 600, 800 and 1000 mg/kg of ethanol extract of J. curcas seed; and the rest intake Diclofenac, Diazepam, Caffeine and a control group not received any substance. 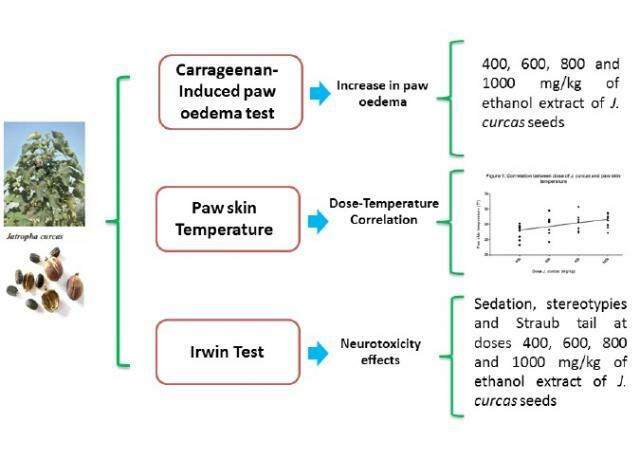 The effects on inflammation was evaluated by Carrageenan-Induced paw oedema test and by Paw skin temperature. Neurological symptoms of toxicity were evaluated using the Irwin test. For the analysis of quantitative variables were used the following tests: one-way ANOVA, Tukey, Shapiro-Wilk and Pearson correlation; for qualitative variables Chi square was used. Results: According to the paw oedema, it was showed a trend on an inflammatory effect of the seeds of J. curcas; this activity was statistically significant in doses of 1000 mg/kg. Also, the skin temperature measurements outcomes reveal a positive dose response manner. Regard to neurological manifestations, Straub tail was founded in doses of 400 mg/kg. Stereotypies were founded in doses of 400, 600, 800 and 1000 mg/kg throughout the evaluation. Conclusion: J. curcas seeds were showed an inflammatory effect. In addition, effects on the nervous system were founded as stereotypes and Straub tail. Alexander Z-, Rommel Z-, Sergio G-, Ernesto Z-, Jorge G-, Angel C-, et al. Study on Inflammation and the Nervous system of Ethanol extract of Jatropha Curcas seed. Pharmacognosy Journal. 2016;8(4):335-340.